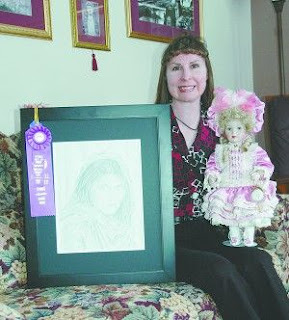 Local artist and Victorian doll creator Mary Ann (Denekas) Hedrick will be exhibiting her "Portraits and Dolls" collection beginning this weekend, Saturday, April 30, at the Mitchell County Historical Museum located at the Cedar River Complex in Osage. Hedrick, a native of Kamrar, Iowa, first found the love for Victorian dolls while traveling with her mother. "My mother (Edna) and I love traveling, especially where there is anything Victorian," said Hedrick. "One of our favorite places is Galena, Illinois, where there are lot of beautiful Victorian homes." She added due to her mother's encouragement, she started to make Victorian dolls. Not only does she assemble the bodies but she also designs the patterns for their dresses and hats. "The dolls with the smocking and bead work are my favorites," Hedrick said. "The smocking is a variation on a technique called ‘American Smocking.'" American Smocking is a variation of English Smocking that is embroidery on pleats that have been pleated before smocking. North American Smocking forms the pleats while you embroider. There is a slight difference in the look between the two with the North American conforming to a grid as there are no pleating threads to shape the piece. "I also make christening gowns with the same type of smocking and bead work as the dolls," she said. Hedrick said it takes her about 14-16 hours to complete a full size-christening gown. "I don't really know how long it takes to create a dress for a doll," she said. "It only takes a few hours to create the doll. However, it is several hours to design and create the hat and dress. "Since I make them as a hobby, I may spend several months, in my spare time, working on one doll." In addition to creating some gorgeous Victorian dolls, Hedrick is also an award-winning portrait artist. She first developed her interest in drawing when she was in high school. "I took every art class offered and when there were no more classes to take, I just kept drawing for extra credit," said Hedrick. She attributes her love for drawing to her art teacher, Ron Dinsdale. "He was a positive influence as a great teacher and a very nice person, always encouraging me," she said. Hedrick worked on many art-type projects in high school and was voted most artistic by her classmates. After high school, she laid down her pencil and paper to attend Hamilton Business College in Mason City. However, through the encouragement of her husband, Michael, she started drawing again. "Michael saw my high school drawings and kept encouraging me to start drawing again," said Hedrick. "In 2007, I bought an instruction book, pencils and paper and as the instructions said, 'practice, practice, practice.'" Her favorite subject to draw is portraits. "I hope to make my portrait drawings realistic and accurate because being able to recognize the person is important to me," she said. Attendees at the Mitchell County Fair in 2010 believed Hedrick was a great portrait artist. She was awarded the "Best in Show" for one of her portraits. The previous year, at the Fair, she received two blue ribbons. "I work with pencil and paper," she said. "I have not worked in any other medium." Although she has done some portraits of family members, she tends to look for a face to draw in books and magazines. "When I start drawing a portrait, I draw the eyes first," said Hedrick. "The eyes should appear to be looking at you. "Also, they need to be the right proportion. If they aren't, I'll start over." Hedrick added after she completes the eyes she creates the rest of the piece around them. "I do regret not keeping up with my drawing after high school," she said. "I think if I had, I would be a much better portrait drawer, now. "Drawing is a fun hobby and I practice as often as I can and hope very much to improve my artistic talents." In her exhibit, Hedrick will be displaying a variety of 20 different original portrait drawings along with 20 of her handmade Victorian dolls.